The above photo is a sample of the continued learning that will be passed on to the students. 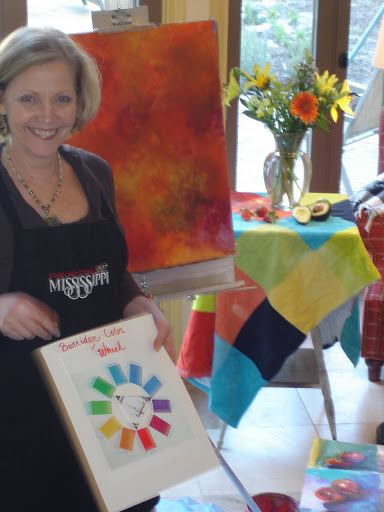 Above: Birmingham artist Justine Rynearson shares tips from a recent workshop at Allison’s home. These are designed for children, but we will have some night classes for adults. at my home studio from 3:30-5:00. Junior High Students and Crestline Students can walk here if necessary. Prices until Sept. 14: $10 / class or 25 for three (works $50 for 6 as well) Reserve now by email or phone with questions to 914-2400. You pick the dates you like. For the $10 I will provide the items to draw with (pencils, markers, paints). I will have paper and regular paint boards for them to use if they do not have their own canvas. For Writing and Illustrating: We will have an optional “publish your own book” kit available. If you would like to have all materials provided, please note that when registering. As an interior Design major at the University of Alabama I had core art classes in their incredible art program, learned perspective drawing,and rendering techniques. I have experience in wallcovering design, graphic design and publishing. As a writer, I have self published two books (illustrated one) and written BIRMINGHAM SKETCHBOOK and written for Montgomery Living, Southern Beauty and other publications. Check out some of our learning exercises at www.highlandartists.blogspot.com for painting experiences. I taught grades K-6 at St. Benedict School on the Gulf Coast and recently had a show at the Orange Beach Art Center.